If you’re the kind of person that scoffs at blends and drinks nothing but single malts, please kindly refrain from finding any of us at a whisky event, because you’re a moron and we have better things to do than talk to you. There are amazing blends out there that offer great value, and you’re a fool to dismiss them out of hand. 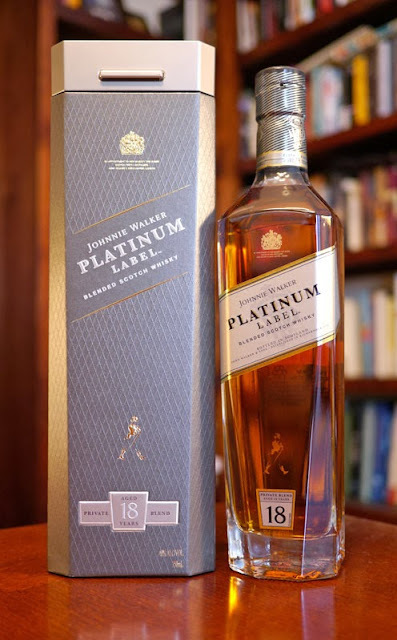 The Johnnie Walker Platinum is a perfect case in point, even if you set aside the fact that you could put the bottle next to a bottle of Chanel No. 5 and the two would make an exquisite couple. The nose is beautiful and complex: a lemonade/orange juice blend served in a palm frond, Crocodile Dundee® body spray for lads down under who can’t get a hold of Axe®, and a note of pineapple banana dish soap we associate with Clynelish and the smell of heaven’s gates opening. The mouth offers a deep caramel note not present on the nose that is just gorgeous and peppery, like a salted caramel dropped warm onto folded newspaper. There’s also some clear Islay influence on the mouth, with a note reminiscent of a lord burning a peat log in his fireplace to commemorate his humble origins (he married up). And there’s even a hint of turmeric on the mouth going into the finish–you know, to help your liver regenerate cells as you kill them off. I mean, these folks have thought of everything with this blend. The finish sits like a Kee’s chocolate in the middle of your tongue or like a Friday evening feels when you know you have a long weekend. It rings and emanates out across your tongue and fills your head as if someone struck a huge round Tibetan temple bell in your mouth. Fantastic. Once you try this dram you will see why, as a new friend of mine recently mused, Johnnie Walker has replaced cocaine as the preferred currency in Colombia. The Johnnie Walker Platinum Label is a cut gemstone–Multifaceted and captivating, they’re also imminently portable, packing great value into a relatively small package. And it’s really pretty. –Our thanks to Alex Conway and Diageo for the sample!